Breakout benches are commonly configured with limited or even fixed arm spacing which makes tool breakout or makeup difficult when there are sensitive joints that cannot be gripped without damaging the tool. The arms of the Scorpion Service Center (SSC) breakout bench series allows arm adjustments of 4 inches to 20 feet, allowing operators to grip on non-sensitive areas of the tool. 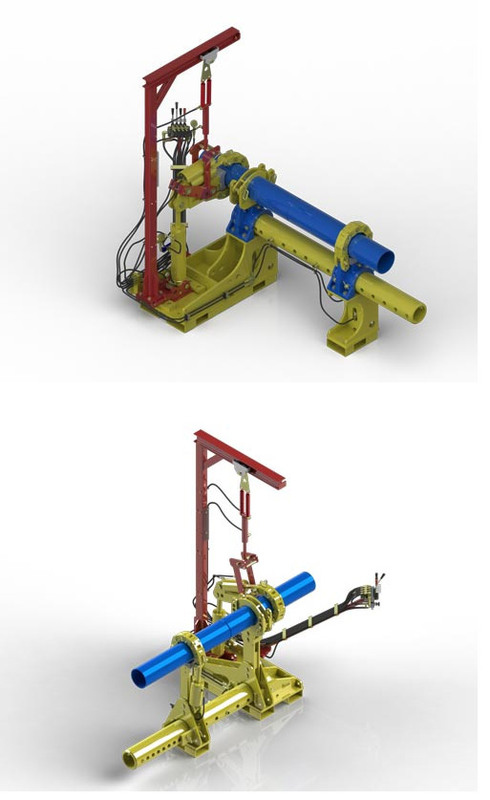 Our machines can breakout and makeup all types of tools - DTH hammers, bits, mud motors, drill pipe, and casing to name a few. Another key difference between a traditional breakout bench or bucking unit and the Scorpion breakout machine is the dual arm setup. Traditional units use a single arm configuration that requires ratcheting the arm forward in order to get a grip. This limits the distance that the arm can turn before requiring re-ratcheting. In addition, it doesn't permit large arm spacing. The Scorpion horizontal breakout units grip the tool with one arm, and makeup or breakout with the other arm. This keeps the tools fixed to the machine, and the tool will stay attached to the machine, even if being broken at high torque (150,000 + ft-lbs). With Scorpion breakout benches, the forces are contained within the breakout machine; therefore, unlike traditional bucking machines, Scorpion units do not need to be mounted to the floor or to any surface for that matter. Scorpion units, including the our SSC breakout benches, are portable and can be moved around a shop or even used in the field, making it a portable breakout bench. Like our other units, our breakout benches can handle up to 36" tools, depending on the series and feature a power pack with a small footprint (electirc, air diesel, and gasoline options are available), as opposed to traditional bucking machines that have very large power units that are not portable. contact Scorpion today to learn more, obtain additional pictures, and even schedule a demo at our Houston facility.